Sabsige Soppu Ambado is a very flavorful fritter. 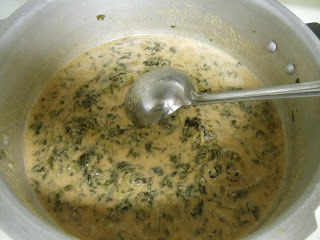 In Kannada, sabsige soppu means dill leaves.This is my own recipe. 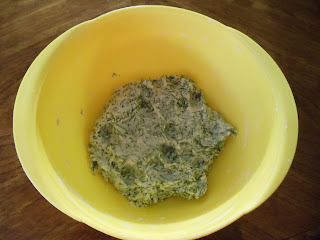 I make rotti often, using dill leaves. Hence thought of including onions to the rotti recipe and then deep fry. They tasted very good. Hence thought of sharing this recipe. 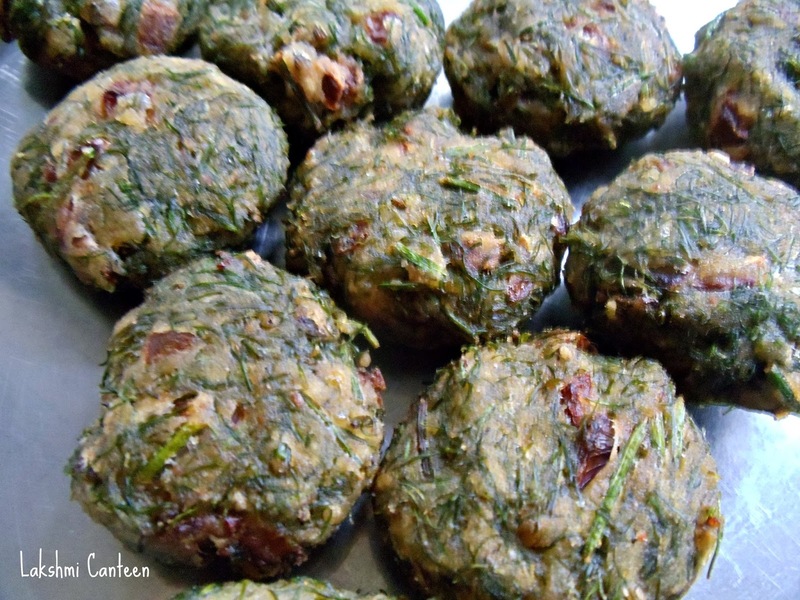 Try making this easy, flavored fritters and enjoy!! Wash dill thoroughly. 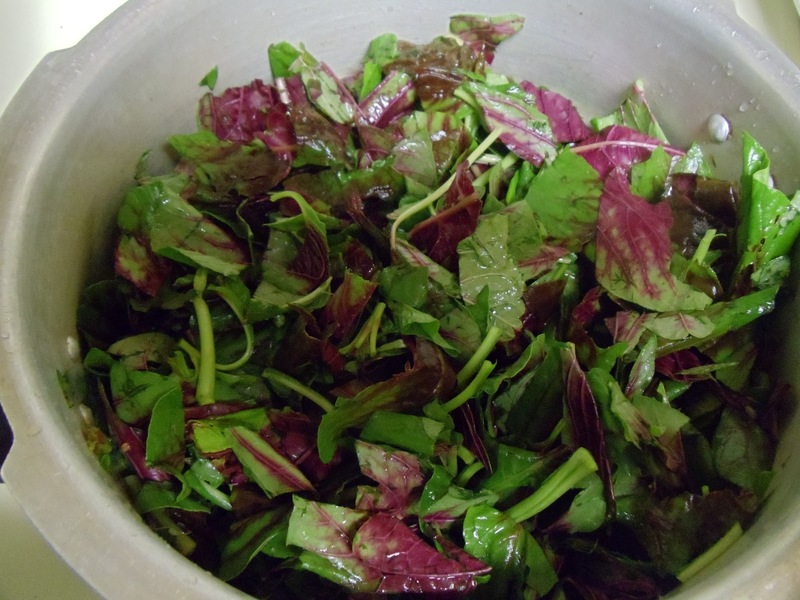 Discard the stem of the herb and then chop the leaves finely. Chop the onion finely. Now take the chopped dill, onion, rice flour and salt in a mixing bowl. Add water in small quantities. Mix it well. The dough consistency should be stiff. 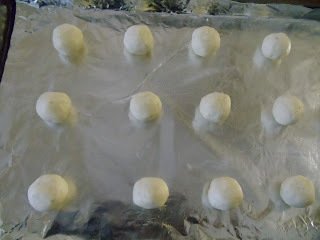 Now make small balls out of the dough and flatten them slightly. 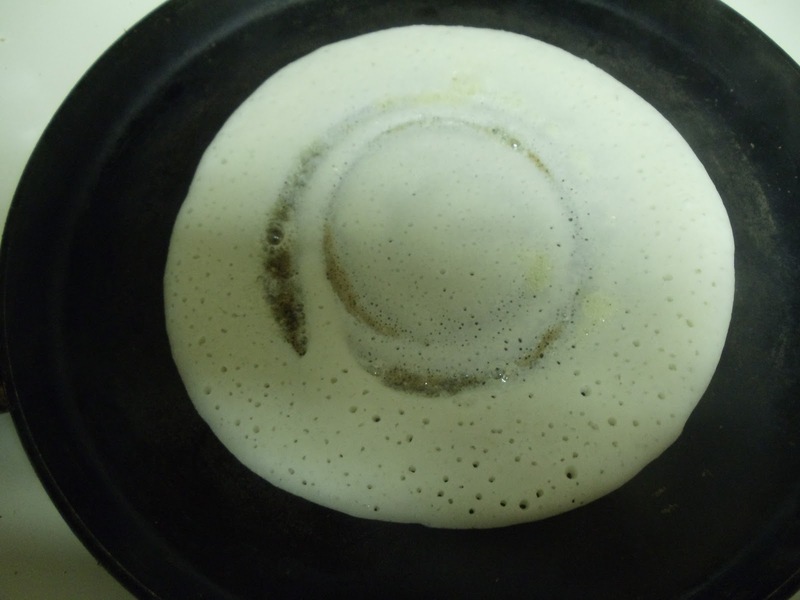 Then deep fry these flattened discs on a medium-high flame until it turns golden brown on both sides. Once done, drain the excess oil on a paper towel. Sabsige Soppu Ambado is ready!! Serve it hot as a side dish to rice or as a snack. Above measurement serves three people. 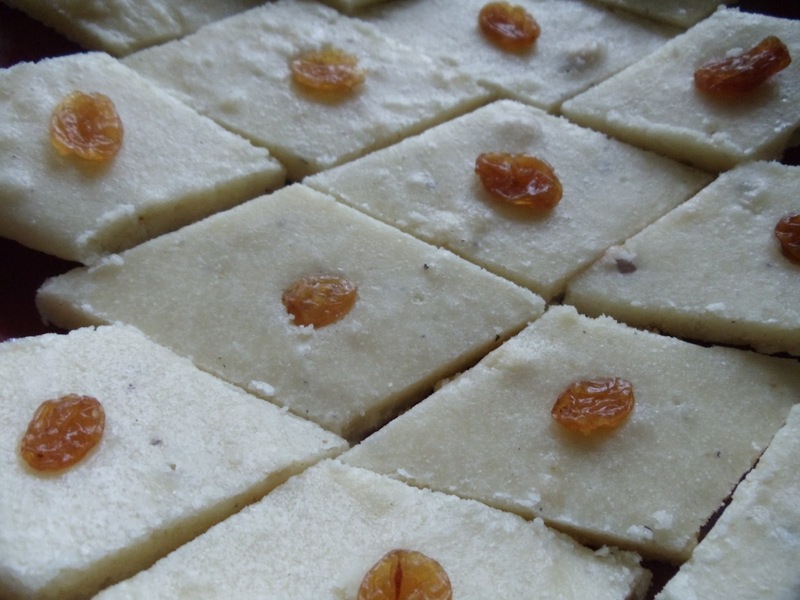 5 Cup Burfi is a very delicious and easy- to -make sweet. It doesn't require any special ingredients. 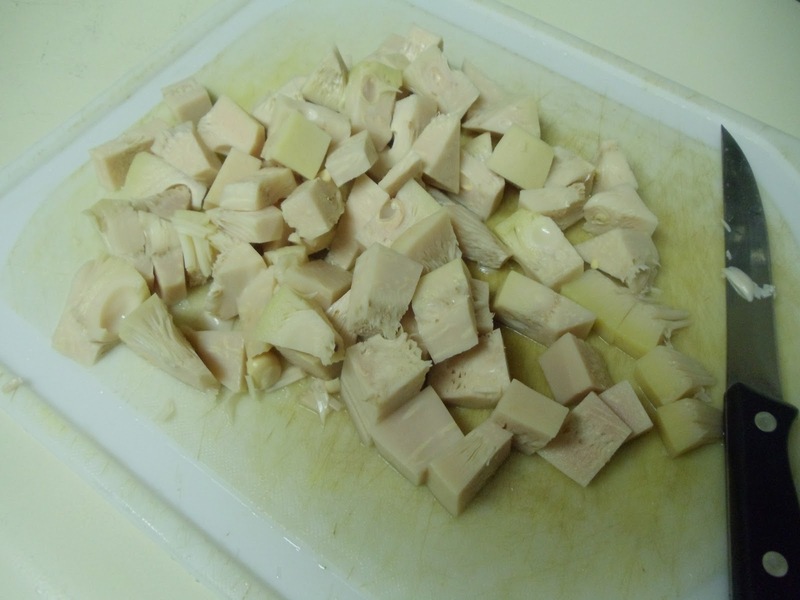 The ingredients used for it, are generally present in everyone's home. I got this recipe from my grandma's sister. I just love this sweet (like any other sweet). I used to make it often in my college days. It was a disaster first two times and now it comes out perfect (you have to be a little careful at the end point). Make this easy sweet for your loved ones. Take all the above mentioned ingredients in a thick bottomed pan( or a non stick pan). Keep it on a medium high heat and mix well to remove all the lumps. Once it comes to a boil, reduce the heat to medium. Keep stirring continuously. 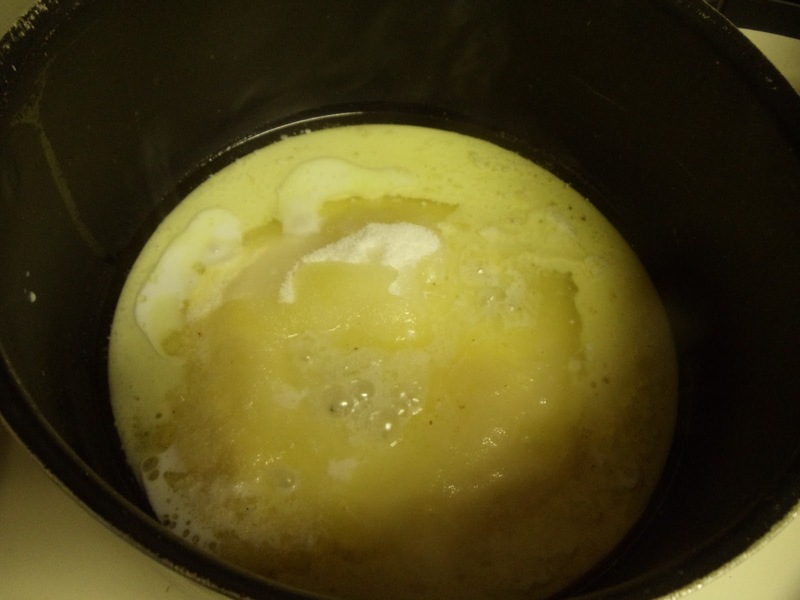 After 15-20 minutes, the mixture becomes less liquidy and slowly the ghee starts separating from the mixture. 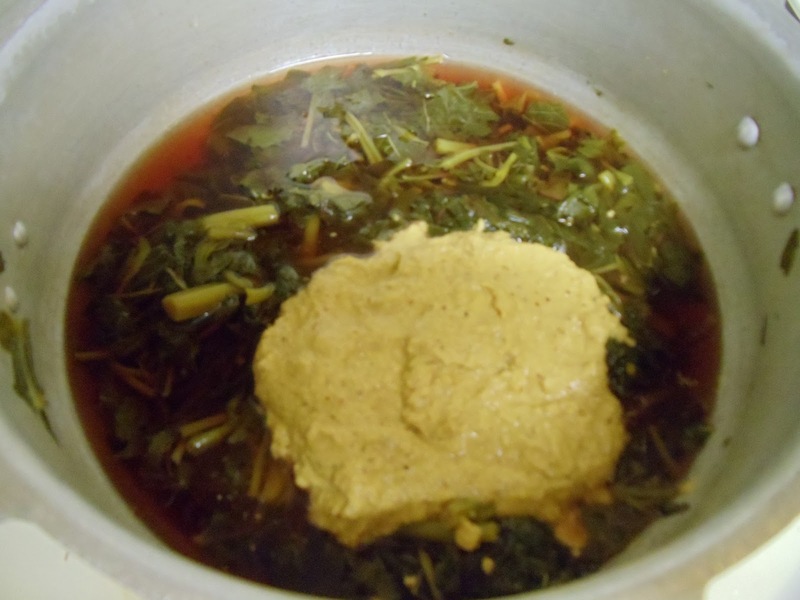 When you see the ghee, continue to heat for one more minute and turn off the heat. Pour this mixture on a plate and spread evenly. 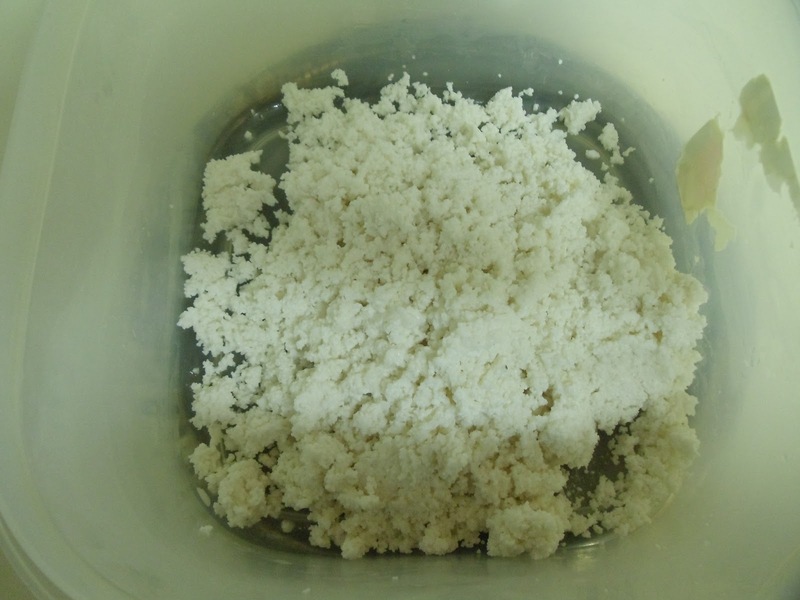 Cut the mixture into sqaures or diamonds before it cools. Garnish each piece with a raisin. 5 Cup Burfi is ready!! Separate the leaves from the stem and look for any worms on the leaves. Wash the leaves as well as the stem. 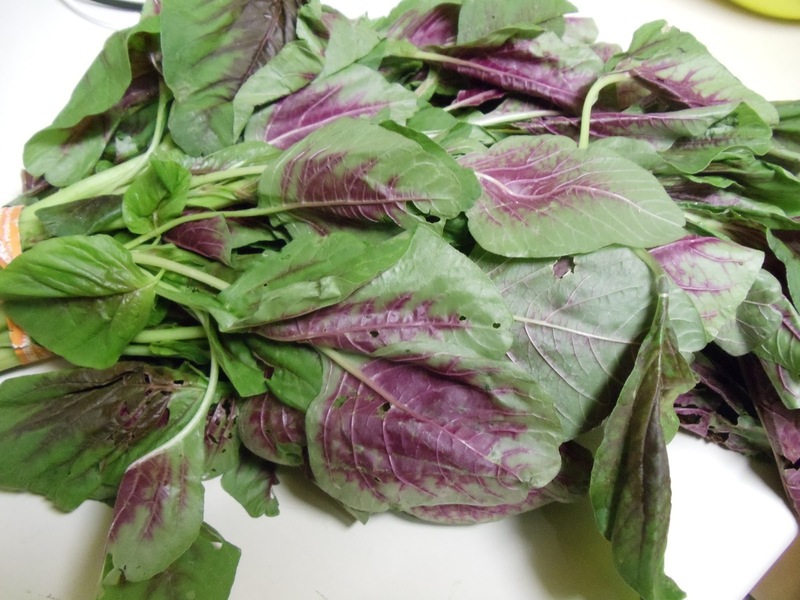 Give a rough chop to the leaves and cut the stem to 5-6cm long. Put them in a pressure cooker with little amount of water (the leaves and stem gives out the water content while cooking. Hence don't add generous amount of water) and salt to taste. Cook it for one whistle. 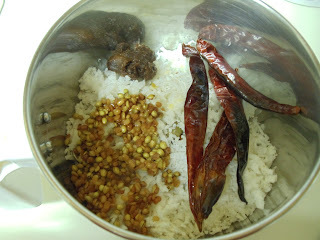 To make Masala- grind grated coconut, roasted red chillies and tamarind to get a fine paste. Add little water, which helps everything to come together. Add this masala to the cooked red amaranth. Mix well and bring it to a boil. Once it comes to a boil, continue heating for 4-5 minutes. Turn off the heat. For seasoning- Heat oil and add the crushed garlic pods. Fry until it turns golden brown. Add this to the prepared curry and mix well. Tambdi Bhajji Randayi is ready!! Serve hot with rice. Above measurement serves two people. Nankatai always reminds me of my amma. Some 30 years back, she would make the dough of nankatai and get them baked in a local bakery. They would charge some amount in return. In this way she was making her own cookies but I never got a chance to eat it:( Looking forward to make some for her in coming days. I got this recipe from Aayi'srecipes.com. 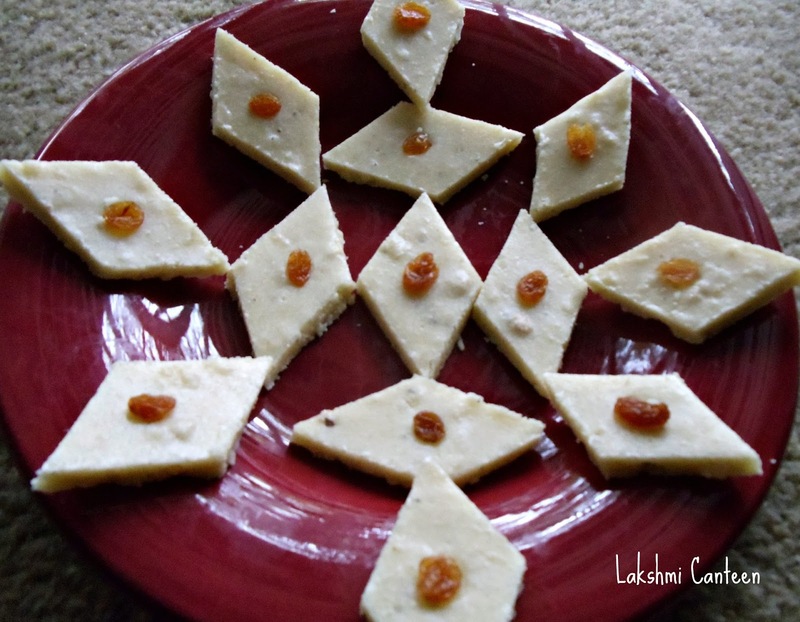 I thank Shilpa for such a wonderful recipe. Mix all the ingredients mentioned above except ghee. Now add ghee to the flour mixture and mix well to get a smooth dough. Let this dough rest for 4-5 hours (keep the dough covered during resting period). 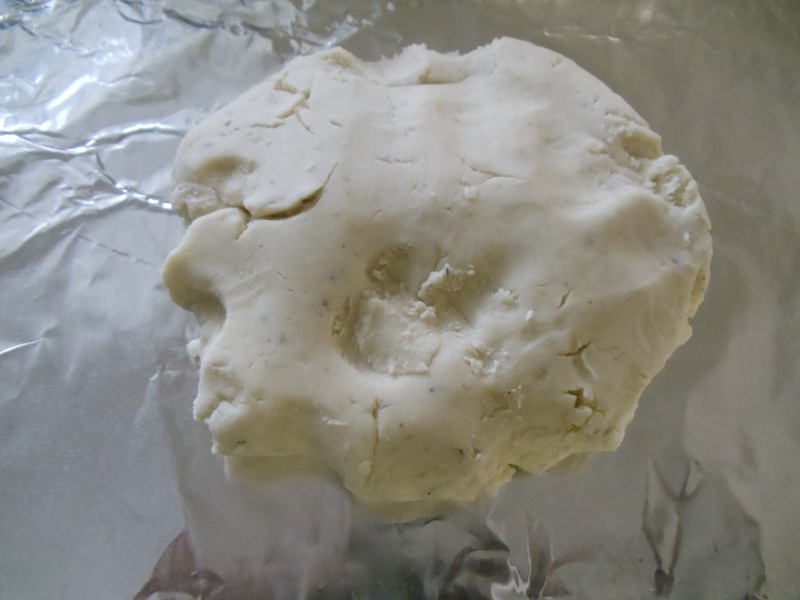 After 4-5 hours, divide the dough into 12-14 equal parts and make small balls. Now take a baking tray lined with aluminium foil (grease it with ghee) or parchment paper or just greased baking tray. Now start arranging these tiny balls on the tray, 2cm apart from each other. Bake them in a oven (middle rack) which is pre- heated to 325F (nearly 160C) for 15 minutes (time may vary from oven to oven). 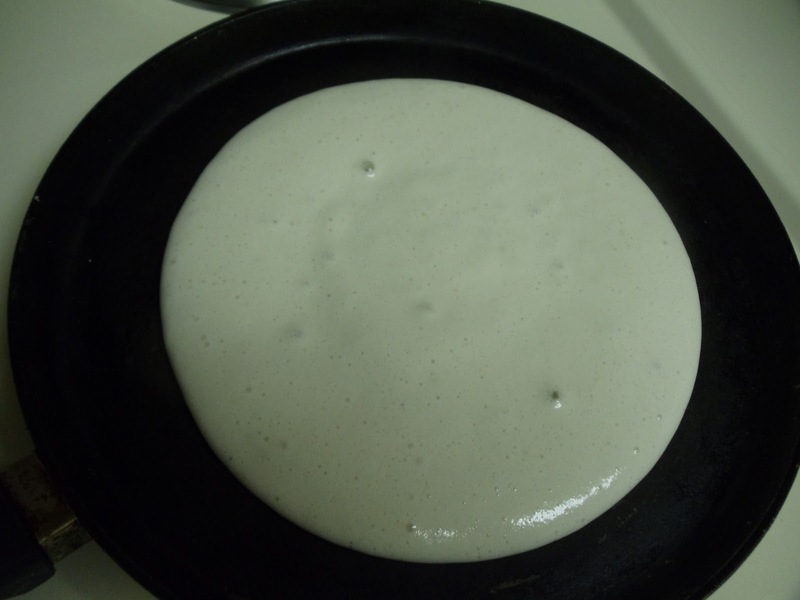 The way to check if its done is- cracks start forming on the surface and the base has to turn golden brown. Turn off the oven and take out the cookies and remove them from tray. Allow them to cool. Narayan Kataar is ready!! Above measurement makes 12-14 Narayan kataars. Enjoy!! 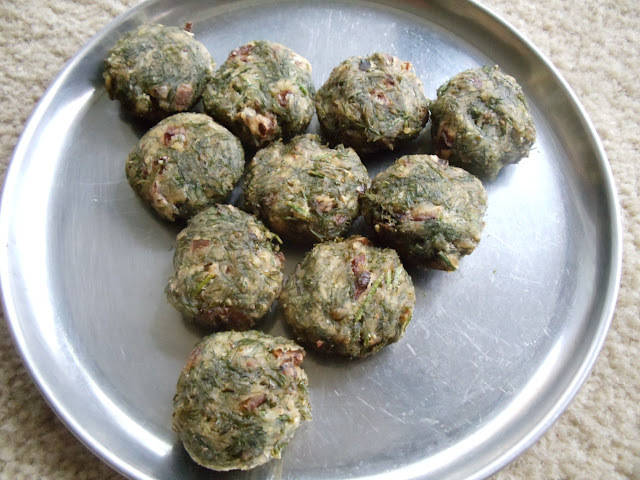 Tuppa polo or Tuppa dose is very commonly prepared in restaurants. 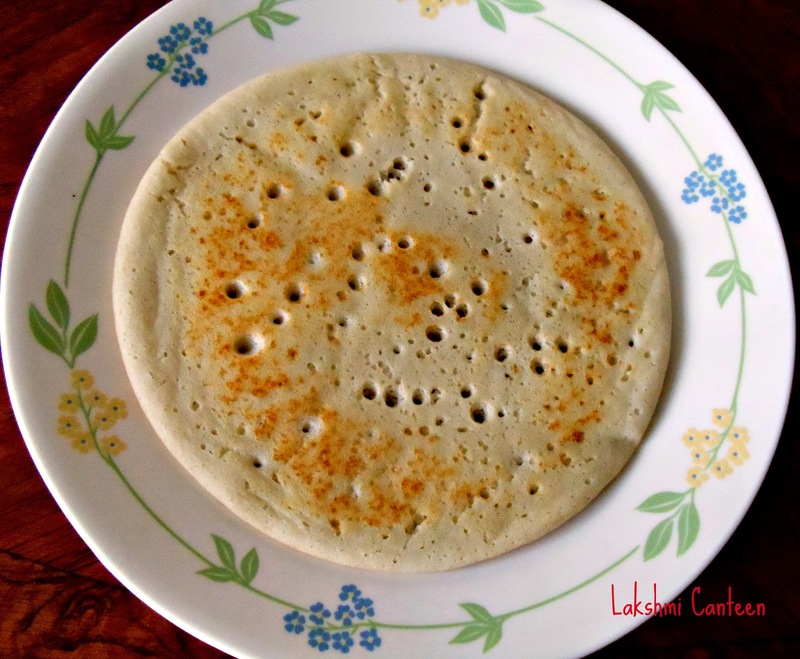 In konkani Thoopa means ghee and polo means dosa. I got this recipe from my aunt some 6 years ago. I had written down the recipe in a book and completely forgot about it. Few days back, when I was making a to- do list of my posts, reminded me of this dosa. So called my amma and took the recipe from her. Also asked my cousin, as she had made this before. I have never tasted this dosa in a restaurant and had no idea as to how it looks or how it is served. 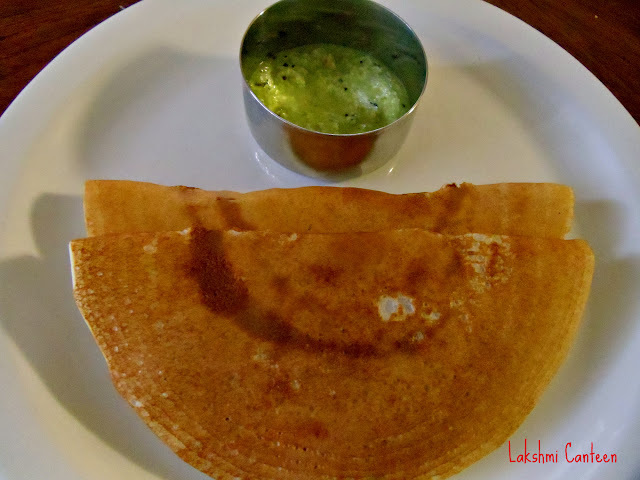 I asked my husband and he told that it was his father's favorite and as he remembered- in restaurant they make these dosas thick and serve it with coconut chutney. I made it the same way and trust me the taste was awesome. Just imagine- the dosas were crispy as well as soft and fried using ghee. What more can you ask for a breakfast? Are you drooling thinking about this? Then make them this weekend and enjoy! 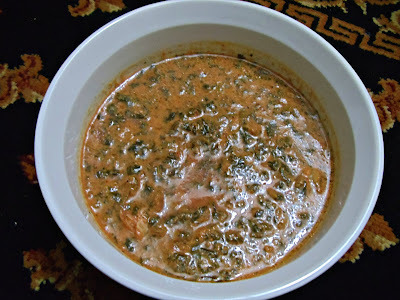 Soak rice and urad dal for 2-3 hours. Grind them together to get a fine paste (don't make it watery). 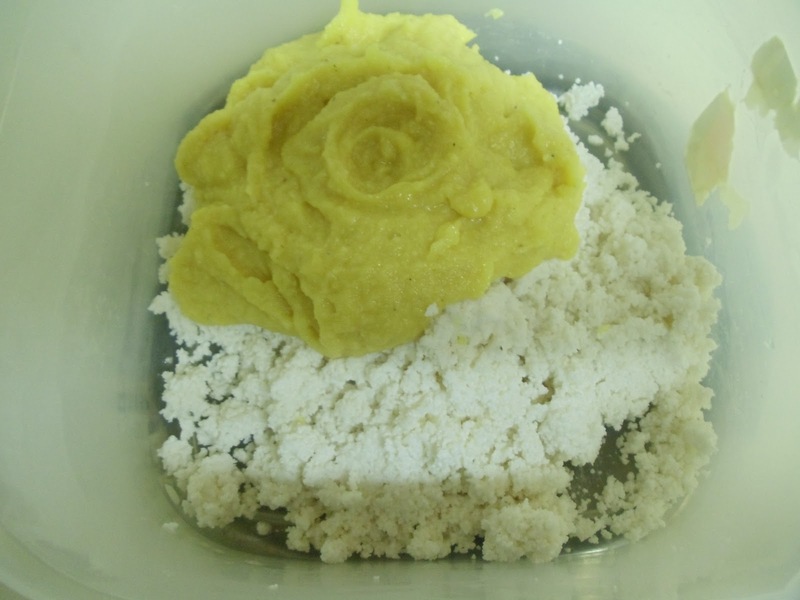 Mix all purpose flour and semolina in a bowl. Add little water as required and mix it properly to remove all the lumps. Add this paste to the rice-urad dal mixture. Mix it well. 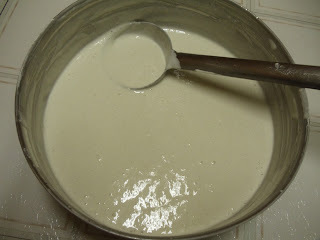 Keep the batter to ferment for 8-9 hours.. After fermentation add salt and adjust the consistency of the batter. It should be medium thick. Heat the pan (medium heat). Pour one full ladel and spread the batter in circular motion (if you want it thick, then don't spread it more) and close it with a lid for few seconds. Open the lid and spread ghee on the dosa. 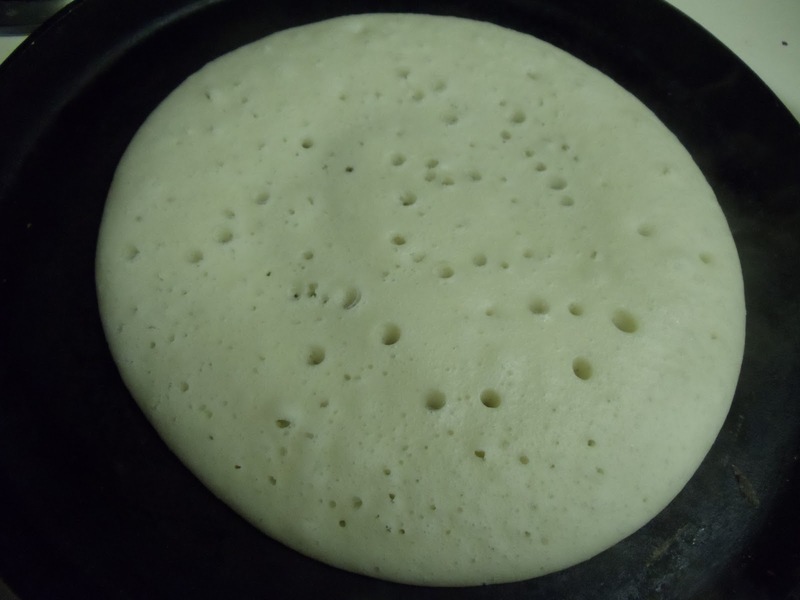 I tried making the dosa thin as well as thick. Both works perfect. Thin dosa comes out very crispy and the thick dosa has the spongy texture on the top surface and crispy below. I loved the texture of the thick dosa. 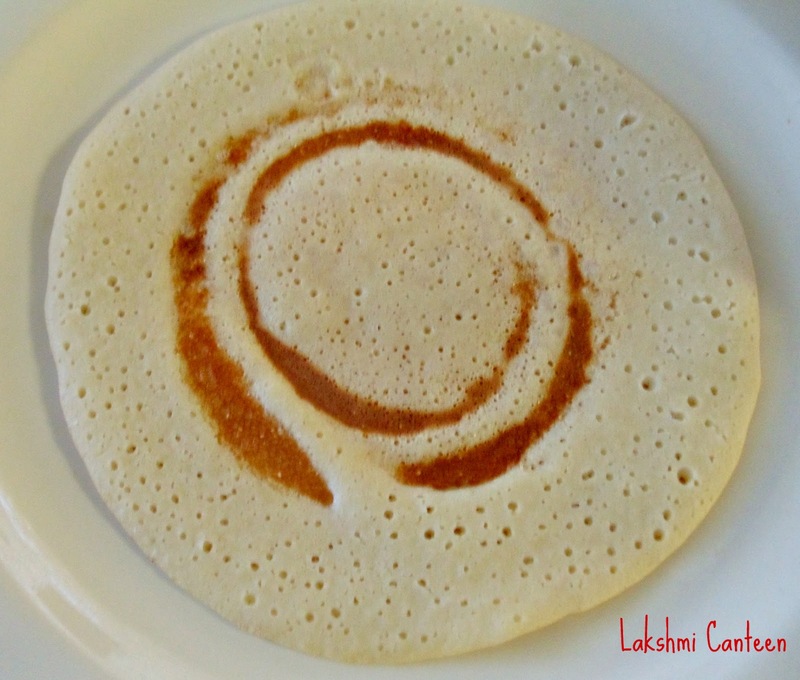 Allow the dosa to turn golden brown or a little darker than that. Tuppa Polo is ready!! 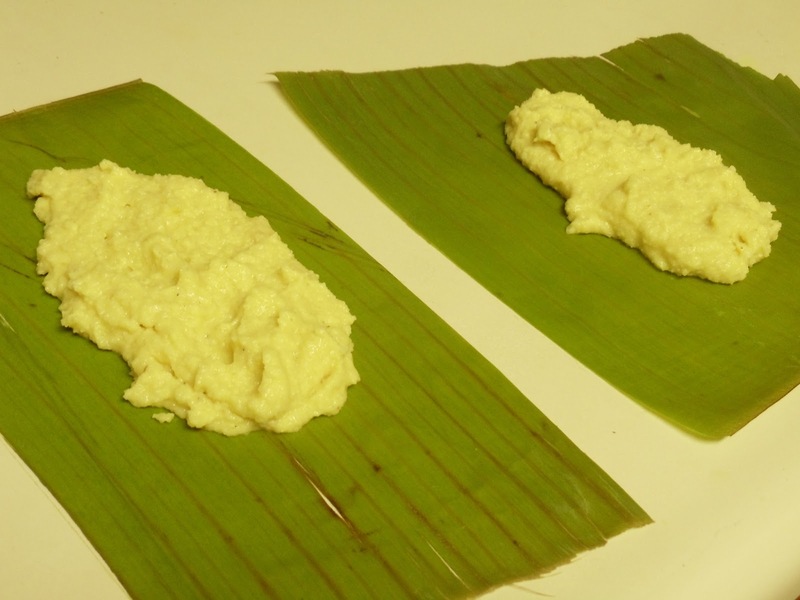 Serve it hot with coconut chutney or any chutney of your choice. Above measurement serves 5-6 people. Kadge Chakko is one of the very popular konkani dishes. Kadgi in konkani means raw or young jackfruit. Jackfruit is very commonly used in the coastal region of Karnataka. The dishes made from fresh raw jackfruit are considered to be very tasty and at the same time cleaning it demands lot of effort. I love jackfruit dishes. Try making this dish. I am sure everyone will like it. Drain the liquid from the tin and wash the jackfruit pieces (if using fresh, then remove the outer hard cover with greased hands). Cut it into small pieces. 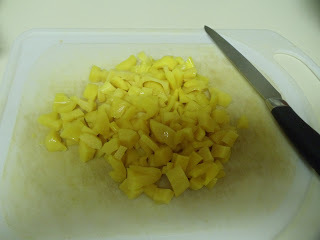 Now pressure cook the jackfruit, along with 1- 1 1/2 cups of water and salt, for 2 whistles. 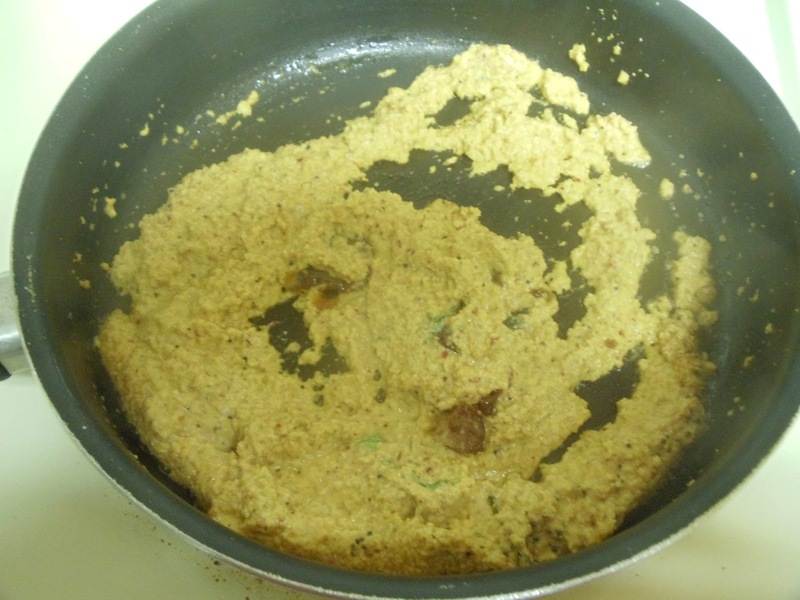 To Prepare Masala: Fry coriander seeds and urad dal in 1/2 tsp of oil, until it turns light brown. Allow it to cool. Now grind grated coconut, roasted red chillies, tamarind, jaggery, salt and roasted coriander seeds, urad dal. Add little water so that all the things get well blended. Don't make the masala very fine. Now take a kadai and heat oil. Add mustard seeds. Once it starts to splutter, add curry leaves and the masala. Fry for a minute. 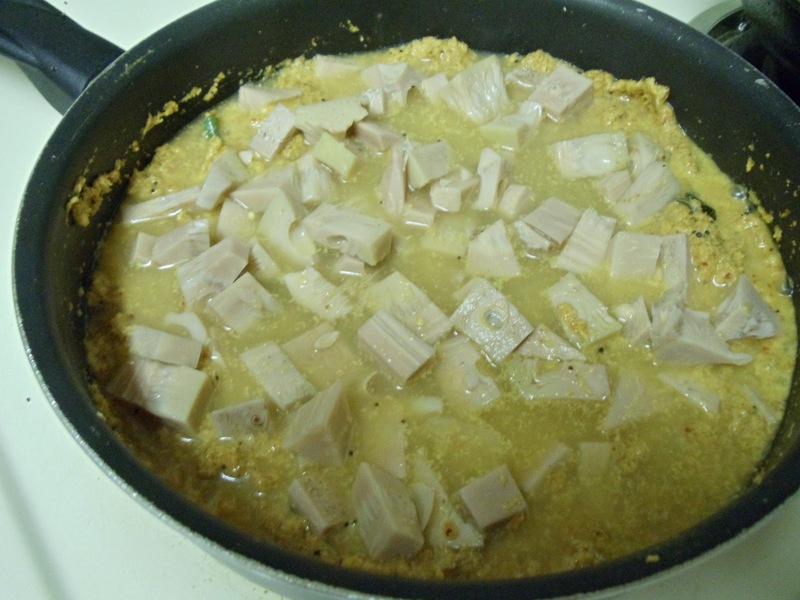 Now add the cooked jackfruit. 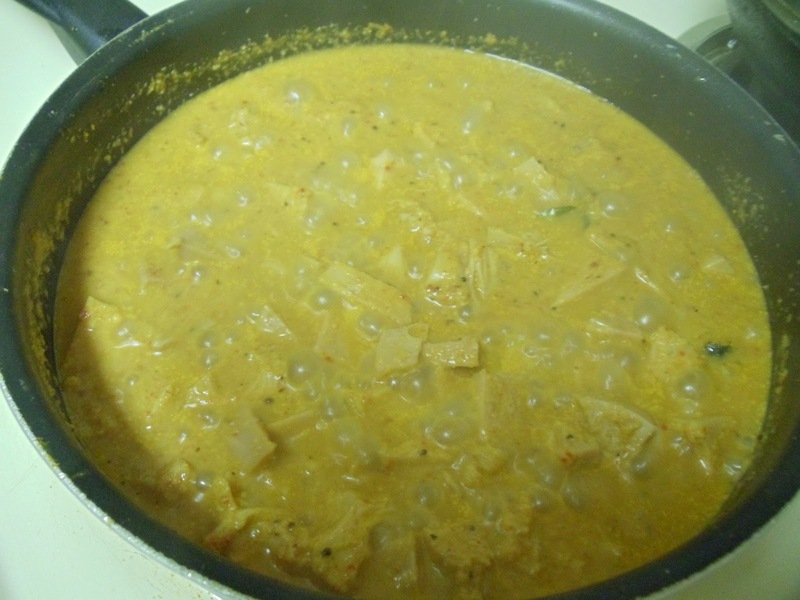 Continue heating for 5-7 more minutes, so that the jackfruit absorbs the masala. Turn off the heat. Kadge Chakko is ready!! Serve it hot with rice or dosa. A good combination would be rice, dalitoy and kadge chakko..Above measurement serves two people. Ponsa Muddo is a sweet idli made from jackfruit. Ponosu in konkani means ripe jackfruit. 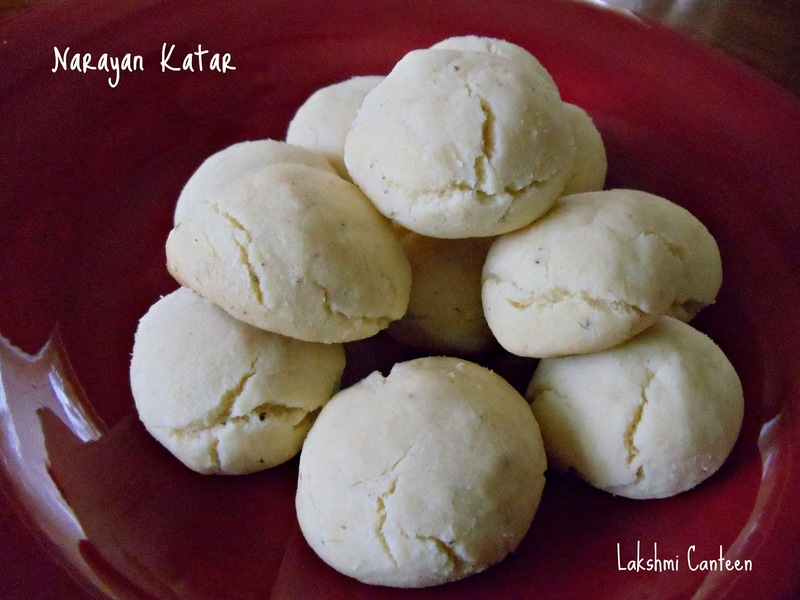 These idlis are commonly made in South Kanara every year during the jackfruit season. 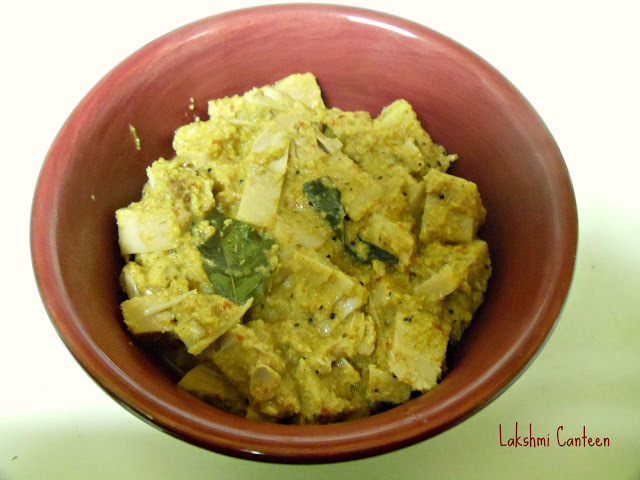 There are a lot of konkani dishes for jackfruit. 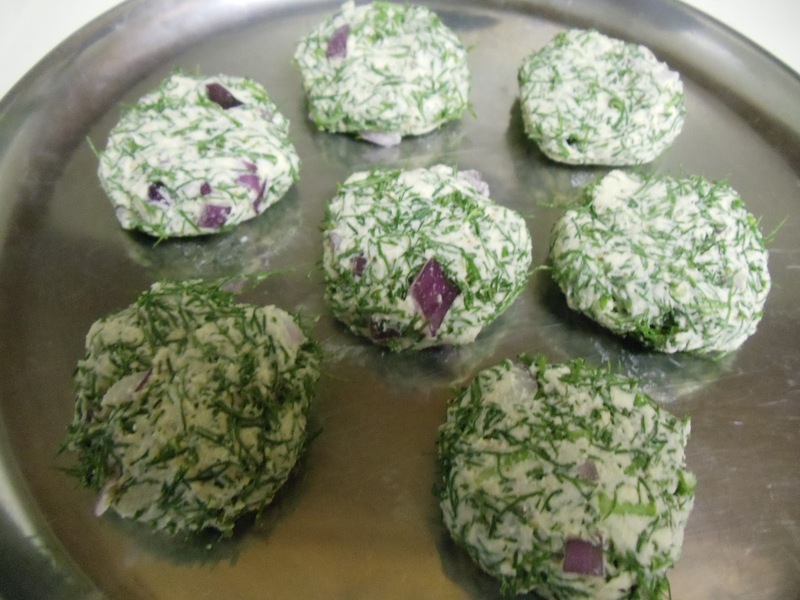 Authentically these idlis are steamed on Teak tree's leaves, which gives a different color and flavor to them. Soak rice for 1-2 hours. Grind it to a coarse consistency as you do for idli, without adding water ( you can also use rice rava). Transfer this to a bowl. Next step would be to grind the chopped jackfruit, grated coconut, jaggery and cardamom. 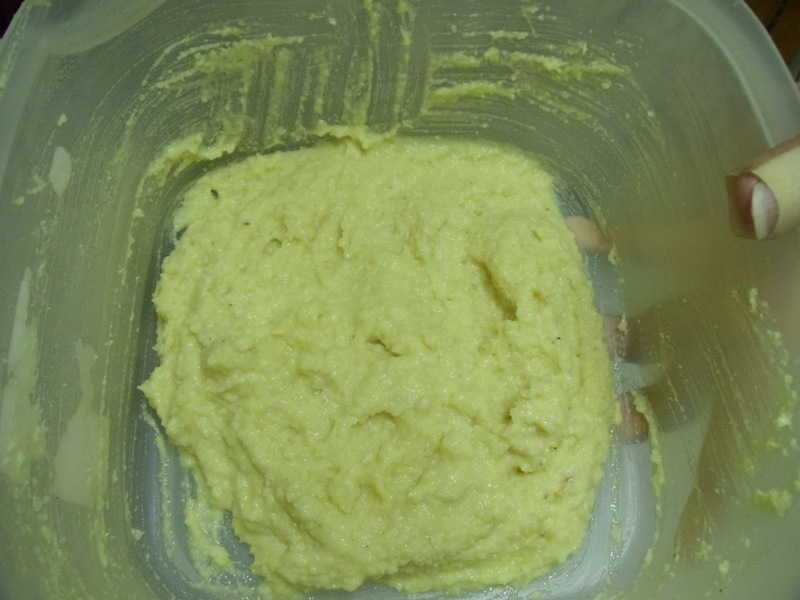 Make a fine paste without adding water. 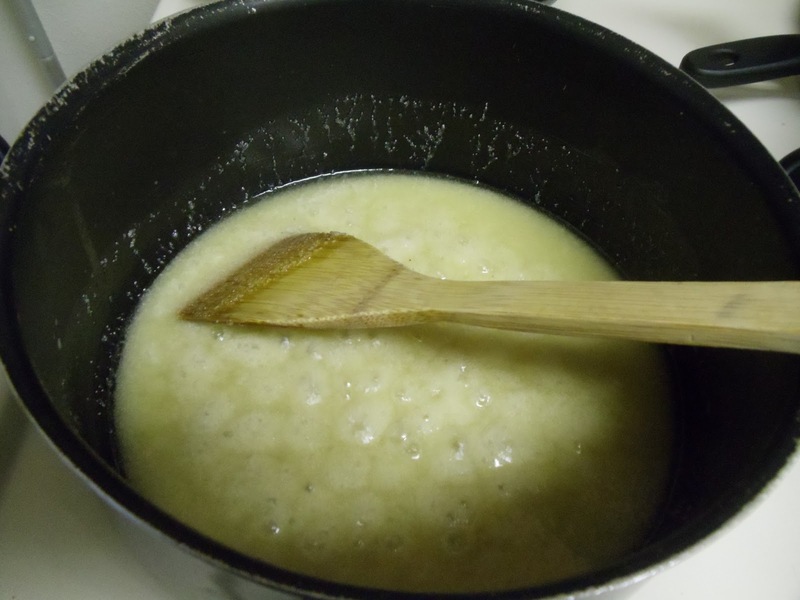 Add this paste to the coarsely ground rice. Now close the banana leaf from all sides and place them carefully in a steamer. Steam it for 25- 30 minutes (refer my similar post Patholi ). Ponsa Muddo is ready!! 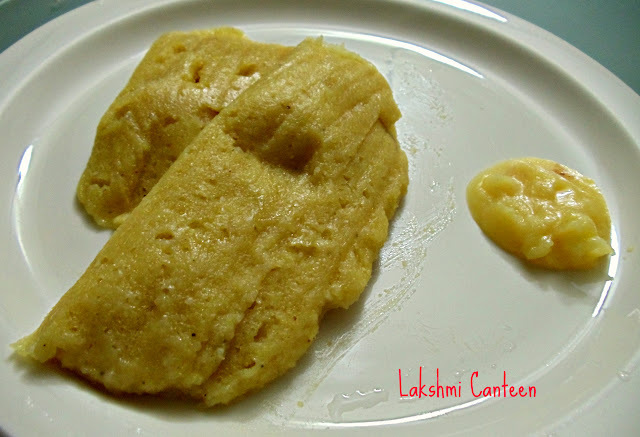 Serve it hot along with generous amount of ghee:-) I made 6 ponsa muddos. Above measurement serves two people. 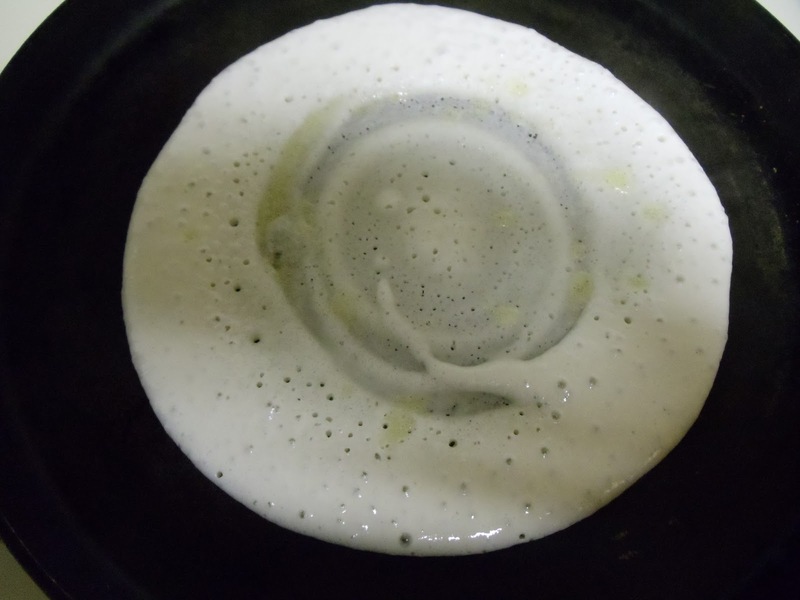 Note: You can also steam the mixture in idli moulds. Gulla Puddi Sagle is a konkani version of stuffed brinjal. Its a very tasty dish. It is cooked in oil without adding water! So now you can imagine how it might taste:-) It is a favorite dish of my father and brother. 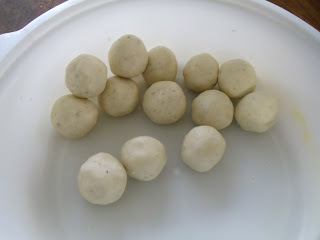 When I was staying in Udupi, my father used to get mattu gulla regularly. 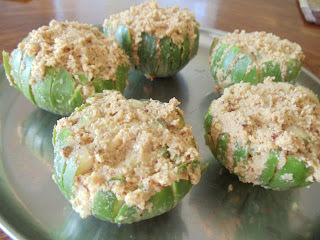 I am not a great fan of these pretty tiny green brinjals, but always loved the masala stuffed in it. After my marriage never got a chance to eat it. I was happy when I saw them in one of the stores. When I made it this time, enjoyed the brinjals as well (after a long time everything tastes good:-)). Even my husband ate it happily, who hates brinjals. Wash the eggplant and remove its stalk. Now, since we have to stuff the masala in the eggplant, we need to cut it in a way that it will hold the masala. The picture below gives an idea as to how it has to be done. First cut it horizontally all along from top till almost the bottom with a space of nearly 1/2cm. Then repeat the same procedure vertically. 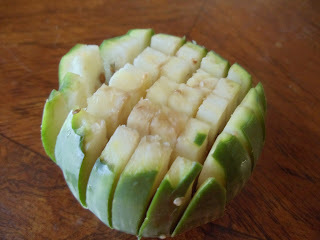 Once this is done put it in a bowl containing water (to prevent blackening). To Prepare Masala: Fry coriander seeds and urad dal in 1/2 tsp of oil, until it turns light brown. Allow it to cool. Now grind grated coconut, roasted red chillies, tamarind, jaggery, salt and roasted coriander seeds, urad dal. Add little water so that all the things get well blended. Don't make the masala very fine. Now remove the brinjals from the water and dry it using a cloth (or paper towel). 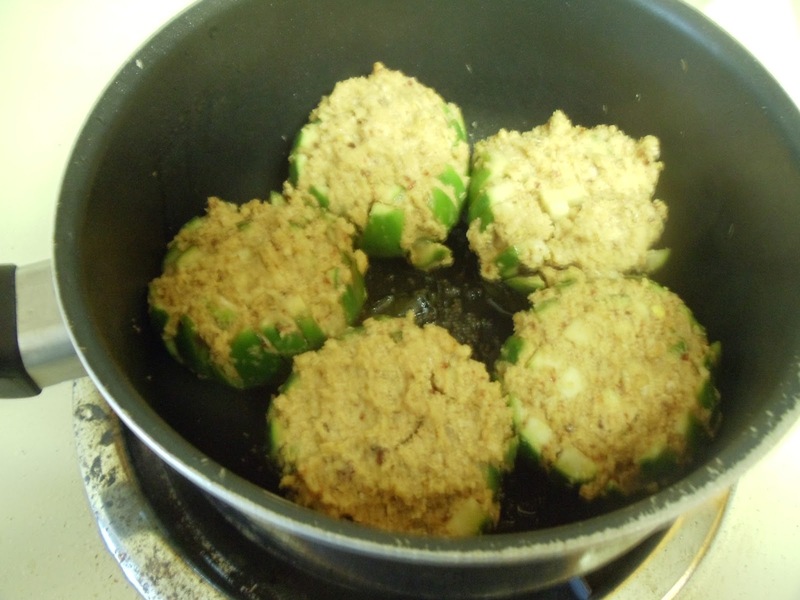 If it has little water in it, then the stuffed masala will start flowing out of the brinjal. Once it is completely dry, start stuffing the brinjal carefully without damaging it. 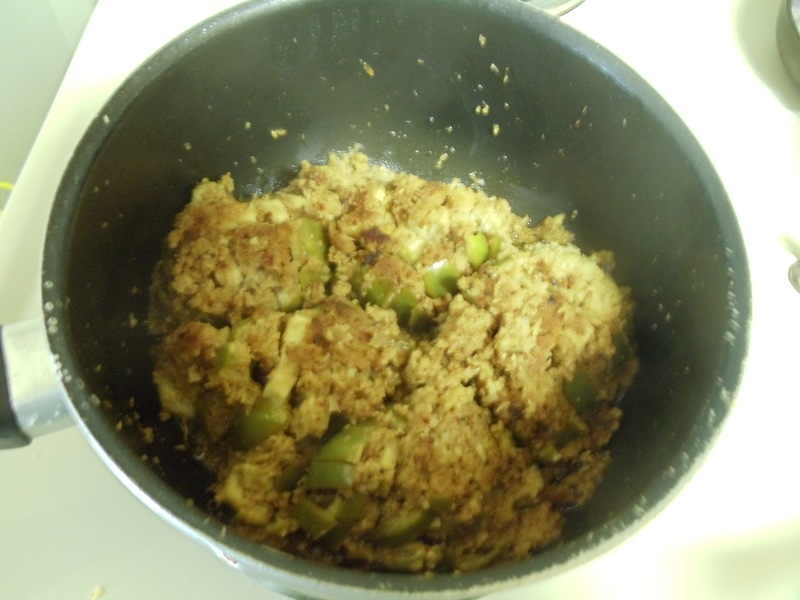 After stuffing, it will look like this. Close the lid and cook it on low heat (less than medium). After 8-10 minutes, flip the brinjals carefully to cook the other side. Close the lid again. it might take 15 more minutes to cook completely. Keep checking in between to avoid the brinjals getting burnt. 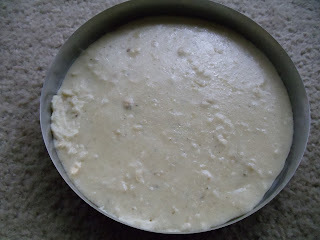 Gulla Puddi Sagle is ready!! Serve it hot with rice or dosa. The best combination I would suggest is- Rice, Dalitoy, Gulla Puddi sagle and paapad (or vodi)..Yum yum..really its a heavenly combination!! Try them soon. Above measurement serves two people. Take a wide bottomed pan and start heating ghee in it (let the heat be on medium through out). Now add cashew nut and raisin. Fry for a minute or two. Then add fresh/dessicated coconut. Keep stirring. When you see that the color of the coconut is going to change, then add semolina. Keep stirring continuously. 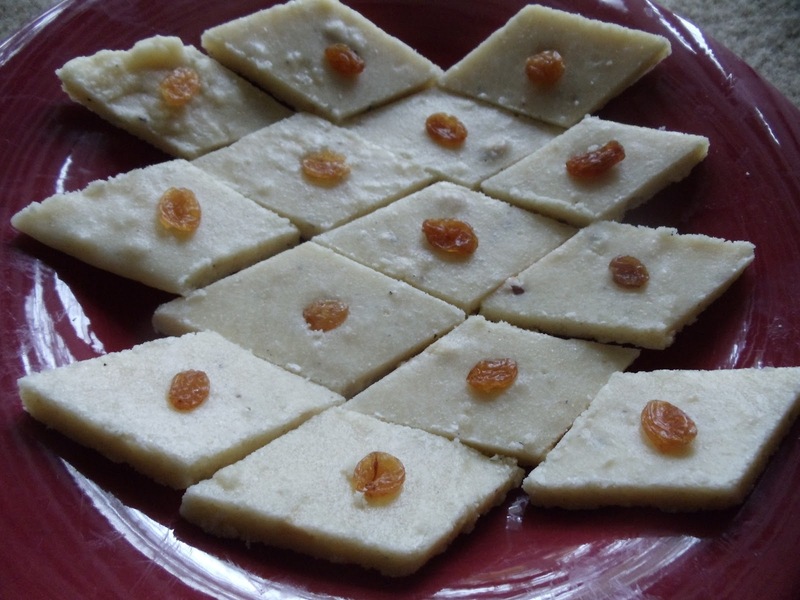 Semolina should be fried until you get a nice aroma and a very slight change in its color. Now add sugar and mix well. Continue stirring for 2-3 minutes. Now add milk and cardamom powder. The semolina mixture turns sticky and even the sugar melts. Heat for 2-3 minutes after adding milk and then turn off the heat. Allow the mixture to cool for 15 minutes. Make balls of the mixture (when it is warm) using greased hand, of desired size (don't worry if the ladoo is soft. It will harden as it cools). Once it cools completely, Rulaoa Undo is ready!! 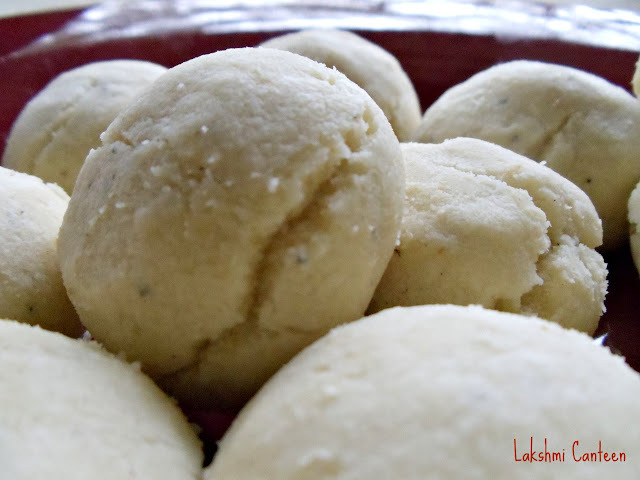 Once the ladoo cools completely, the outer surface turns hard while inside, it still remains soft. 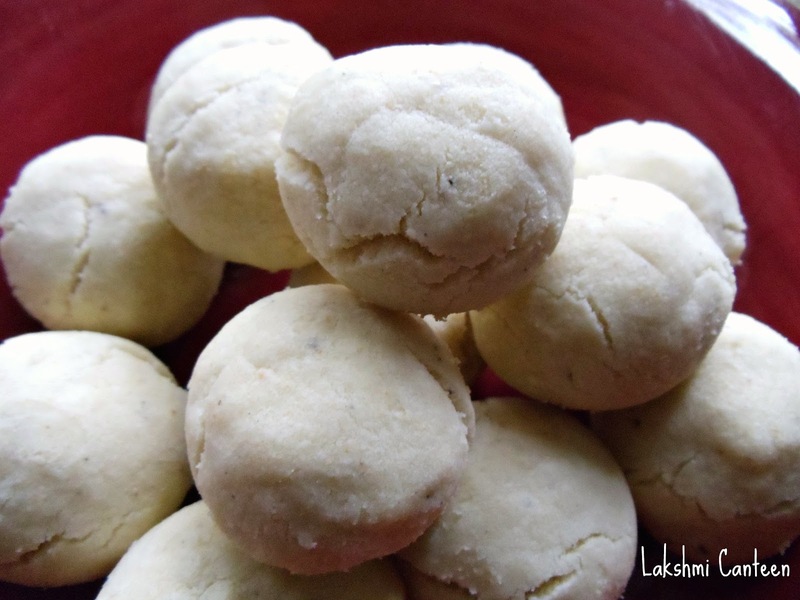 Above measurement makes 10-12 ladoos.